The commercial heart of the city, bustling Midtown is, for most people, a place to go home from at the end of the day. For those who choose to live there, good value and easy access to anywhere in the city are big draws. There is so much packed into this area that it breaks into distinctly different districts. 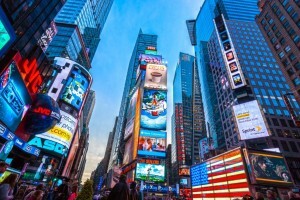 The Theater District, centered on Broadway at Times Square, is the definition of “Bright Lights, Big City” with hundreds of large animated billboards, Broadway theaters, jazz clubs, comedy clubs, and more. Tourists, performers, and anyone else passing through are caught up in the swirl of activity day and night. Restaurant Row, on 46th St between Broadway and 9th Ave., packs almost 20 restaurants into 2 blocks. High-rise buildings offer even more competitive pricing in this district than in neighboring Hell’s Kitchen. Just south of the theater district, the Fashion (or Garment) District is home to legendary fashion design houses and the Fashion Institute of Technology. Nearly every storefront is geared toward the fashion industry, supporting a tight-knit community feel. Professionals in this industry can find live/work friendly options here as well as an increasing number of newly constructed condos with posh amenities and a lower price tag than elsewhere in the city. At night it’s quiet here, but hopping Chelsea is just next door. Just south of Central Park lies some of the most expensive real estate in the city. Luxury high-rises with iconic park views hold court alongside The Plaza Hotel, Bergdorf Goodman, and Tiffany’s. Well-heeled residents dine at the many white table-clothed restaurants in the area and frequent Columbus Circle’s Time Warner Center for an indoor mecca of glass-enclosed, high-end shopping and dining. The world-class boutiques of Madison Ave. on the Upper East Side are just a block away. The area around Grand Central Station has been rezoned to allow redevelopment of some of the tired high-rises and to incentivize more businesses to move in. Already, plans are in the works for a new development and public plaza adjacent to Grand Central. The neighborhood is also home to Grand Central Station, Penn Station, and the PATH terminal.